A couple of days ago I posted about a McCormick product that I had tried. I had a little bit of leftover seasoning so I figured I would morph it into another meal. I'm all about the "less is more" philosophy when it comes to cooking. I don't think something that tastes good should require a lot of ingredients. 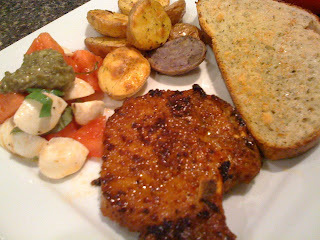 Presenting: Apple Bourbon Pork Chops. Pour the Bourbon, Apple Juice and seasoning into a ziploc bag. Knead to combine. Add the pork chops. Allow to marinate a minimum of 30 minutes up to 5 hours. Bake at 375° F for about 35 minutes. Feel free to try this on a grill if you wish.